Looking for any food offer? There was a time when you had a mood to eat outside then you needed to pay full at the restaurant but time has changed with the birth of online food ordering websites and apps like food panda, box8, fassos etc who give huge and unbelievable discounts to lure customers. 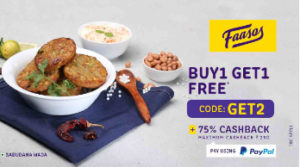 Well, Faasos is back again with an amazing deal Flat 75% cashback on Transaction via Paypal (Max Rs 250) . Hurry up and enjoy the delicacy !! How to get Flat 75% cashback on Transaction via Paypal (Max Rs 250)? Get 100% Cashback Upto Rs.150 On Your First Order. offer available on 1st every paypal transaction?